Our Song Bird Salad Serving Bowl is crafted from exceptionally hard beautifully burled Acacia Wood. Exceptional joinery creates an elegant, inlaid look. The wide shallow bowl showcases the elegant bounty of your salad and allows for ease of service. 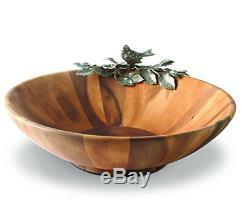 The bowl is embellished with a sweet, pewter song sparrow perching on a leafy branch. 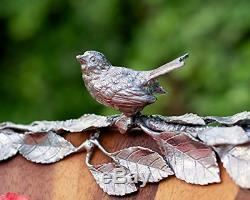 3-D pewter songbird decorations are cast in delicate detail, and finished by hand. The unique combination of Vagabond House pewter and fine acacia form a bowl that is a celebration in beauty and will bring grace to your table for years to come. Chatoyant Acacia wood bowl can "fool the eye" with color changes in varied lighting - Handcrafted, solid lead-free pewter details on an Acacia wood bowl - Wood Care: Oil 1x when new, then yearly with mineral oil; let soak in 1 hour or more, wipe off. Hand wash in warm water, use mild, non-acidic soap. Rinse, Dry completely - Elegant bowl arrives in a Vagabond House logo box perfect for wrapping. 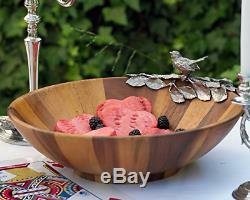 Vagabond House Acacia Wood Large Salad Serving Bowl with Pewter Song Bird 16. 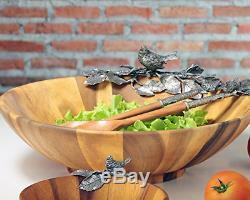 The item "Vagabond House Acacia Wood Large Salad Serving Bowl with Pewter Song Bird 16" is in sale since Tuesday, December 25, 2018. This item is in the category "Home & Garden\Kitchen, Dining & Bar\Dinnerware & Serving Dishes\Serving Bowls". The seller is "jlolzo112" and is located in Miami, Florida. This item can be shipped to United States.